Peter Stewart loves his daughter, Austin, more than anything. Follow his story as his daughter's addiction takes over her life and his hunger for revenge becomes insatiable. An Acre of Fools, May 10 - Addiction hurts not only the abuser, but anyone in its wake. Heroin's destructiveness on lost soul, Austin Stewart, might not kill her, but it will ruin everything and everyone that was ever good to her. When Peter decides its time to avenge his daughter's closeted skeletons, he risks losing all the light that already went dark for Austin. Author, Aden James, speaks to the reader page by page, with his own daughter's heroin battle intertwined throughout the novel. The nightmare he portrays is very real, and very relatable. Peter's fight with the disease, his daughter and her romantic interests alike have gained the attention of some very formidable reviewers. Ellen Wallace of True Crime Reviewer writes, "The novel is beautifully written and engages the reader early and easily. The foundation of the novel poses supremely human characters facing the conflict of their actions versus spiritual teachings, the struggles of parenthood, and the manipulative devil of addiction." Sally Shupe of Book Reviews, Etc. 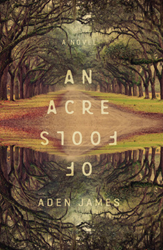 writes, "Aden James portrays a true-to-life saga of what happens to a family fighting addiction, how they are drawn closer together and pulled farther apart." Released today at all major retailers, An Acre of Fools will draw readers into a very real connection with its characters and plot and a new understanding of narcotics addiction. Ninety percent of book sale proceeds will be donated to causes focused on addiction, human trafficking, and family restoration. Find more information at http://www.ElevatePub.com.